Understanding these three dynamics could be crucial to making smart investments in the technology sector. The tech sector was the market's top performer in 2016, and its deep and far-reaching impact on business and everyday life suggests it will continue to be a go-to for investors seeking tremendous growth opportunities. Technology is fast-moving and tends to be highly competitive, so companies that operate in tech -- including Skyworks Solutions (NASDAQ:SWKS), Qualcomm, and Alphabet (NASDAQ:GOOG) (NASDAQ:GOOGL) -- are constantly facing new pressures that influence future outcomes. While investing in the broader space has been historically rewarding over the past two decades, staying on top of the dynamics that are shaping the industry is essential for new and seasoned investors alike. To provide readers with a primer on some of the most important elements shaping the financial performance of tech companies, we asked three of The Motley Fool's top writers to each spotlight one of the most important things to know about the technology sector. Profit margins matter. A lot. Brian Feroldi: One of the most challenging aspects of investing in the tech sector is that competition tends to be fierce. That fact makes it quite difficult for companies to maintain their profit margins over the long term, which can lead to disastrous results for investors. 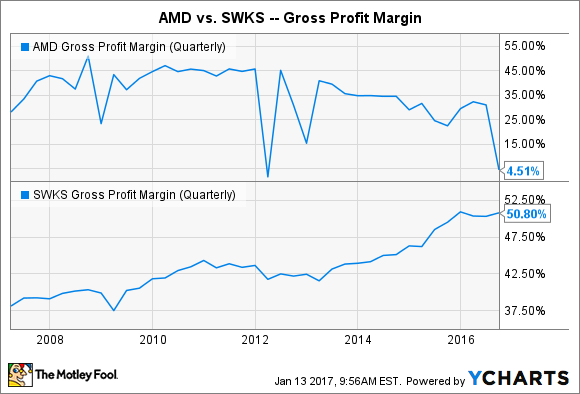 A nice case study of this principle in action can be seen by comparing the long-term results of two semiconductor manufacturers -- Advanced Micro Devices (NASDAQ:AMD) and Skyworks Solutions. 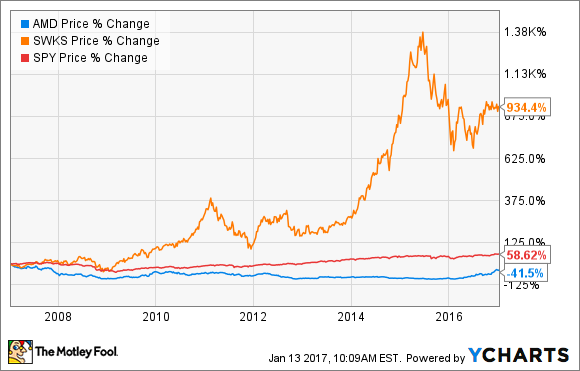 Over the past decade, AMD has struggled to convince customers that its chips are deserving of a premium price tag, which has led to a significant decline in the company's gross profit margin. Over the same time period, Skyworks' focus on manufacturing specialty chips that are used in mobile devices has allowed it to increase its gross profit margin. AMD's inability to maintain its profit margin has caused its stock to languish. Skyworks, on the other hand, has turned out to be a home-run investment. The takeaway here is clear -- before you buy a tech stock, or any stock for that matter, ask yourself if the company will be able to maintain its pricing power over the long term. If the answer is no, your money is probably best invested elsewhere. Keith Noonan: The tech industry is going through a major period of consolidation, as companies operating in the sector aim to create defensive benefits, quickly ramp up competencies in emerging categories such as the Internet of Things, and build encompassing platforms that keep customers engaged in their ecosystems. 2016 saw a huge acquisitions push across hardware, software, and services. Qualcomm's $47 billion acquisition of NXP Semiconductors was the biggest deal of the year and rapidly accelerated the company's position in connected cars. Intel also went on a purchasing spree to strengthen its competitiveness in automobile chips and services. Companies with strengths in the Internet of Things will continue to be acquisition targets going forward, and 2017 looks to be another big year for purchases related to connectivity and data analytics technologies. Many of tech's big players are also buying up assets outside of the sector -- and entertainment companies are emerging as common acquisitions targets. With Facebook (NASDAQ:FB) and Alphabet dominating the advertising business and making moves toward disrupting the traditional internet service provider and wireless carrier models, some companies threatened by the commoditization of their services are responding by bolstering their positions in content. Comcast continued its push to grow its studio entertainment business by buying DreamWorks Animation in 2016, and AT&T has made an $85.4 billion bid to acquire Time Warner -- a move that comes on the heels of its $49 billion acquisition of DirecTV. The AT&T and Time Warner merger faces regulatory obstacles to closing, but the power held by Facebook and Google and the broader climate of consolidation bolster the case for approval. Buying a company in the hopes that it will be acquired is a risky investment strategy, but there's incredible momentum in acquisitions, and it seems all-but-certain that the tech industry will continue to be shaped by the ongoing consolidation push. Brian Stoffel: There is, perhaps, no skill set more in demand than those who know how to code, create, and design technology, especially when it comes to designing user-friendly interfaces. There's a huge chasm between the techno-nerds who know how to make stuff, and the rest of us mere mortals. Having a team of individuals who take a very complex system, and make it very simple and easy to use, is what separates the winners from the losers in the technology field. That's why attracting -- and retaining -- top talent is so important in the technology sector. It helps explain why companies such as Twitter (NYSE:TWTR) can pull in $415 million in free cash flow over the past year and still post a loss of $380 million . Much of that difference is in the form of enormous equity bonus packages paid to employees. One way I like to note how well a company is doing at keeping its talent is by going through Glassdoor.com reviews. Companies such as Facebook do extremely well, with an average rating of 4.5 stars out of 5.0. And organizations that "get" what motivates a workforce can make a huge difference as well. [Monetary] incentives are secondary to career growth, work environment, and engaging work opportunities. We seek to develop a highly motivated and collaborative workforce that pursues achievements for the sake of progress and innovation. It's that type of thinking that can turn technology companies into decades-long wealth builders, and it's what investors should be looking for.